My friend approached me several months ago about making a cake, and I was already booked on the weekend she needed it, so it didn't work out for me to help her out that time. She recently called me again about making a cake for her in-laws' 50th wedding anniversary. I couldn't very well tell her "no" twice, so we got together to talk about cake designs. The couple of honor is German, and Germans LOVE their desserts, so this cake will be the centerpiece among many desserts at the reception. My friend decided she didn't want anything too fancy or flowery, and she quickly fell in love with this quilted fondant pattern. Only the one in the magazine was white and had colorful flowers on it, so we looked for other options to decorate the top of the cake and came up with a bow. 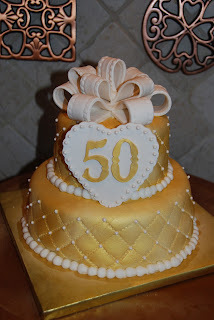 She was fine with the cake being white, but wanted to incorporate gold in the design somehow. The cake inside was white chocolate with raspberry preserve filling. I have never had good luck with fruit fillings, and this time was no exception. I put a few rows of icing around the outside border of the bottom layer before spreading the raspberry preserves. Then I stacked the layers of the bottom cake (9" round) and put a crumb coat of icing on it. When I tried to put the second coat of buttercream on the cake, it seemed unstable, and the filling was trying to escape and leak out. The icing between the layers kept bulging out and making the cake look slumpy. I was so worried that I was going to have to re-do the bottom tier, especially after adding more weight by putting a layer of fondant AND a second tier on top of it. But, as you can see, the fondant ended up holding the cake together after all. I used a roller to make the criss-cross pattern in the sides of the fondant. Then, I stacked the tiers, sprayed them with edible gold paint, and piped the white border around the bottom of each tier. Hayden helped me attach all of the sugar pearls. 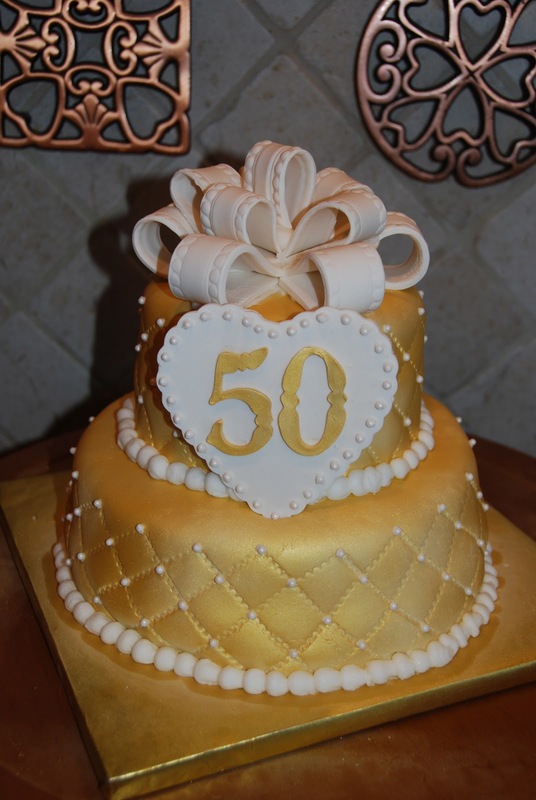 I assembled the gumpaste strips into the bow on top and attached the gold "50" to the gumpaste heart and outlined it with pearls too. After it was dry, I flipped it over and attached a flat stick to the back with candy melts. I was really pleased with the way this cake design came together. My friend was thrilled with it too! Can't wait to hear how much the Germans enjoyed it!